To tackle the entire year of sports is not a job for one man. Fortunately, we here at the Same Page managed to rope in two men to take a look back at the highs and lows in the world of sports in 2012. Read Part 1 here and then enjoy Part 2. Chris: My first memorable moment of 2012 is the Los Angeles Kings Stanley Cup victory, and the re-emergence of hockey in California. The Kings and the Cup in 2012. On August 9, 1988, the Los Angeles Kings acquired Wayne Gretzky from the Edmonton Oilers. 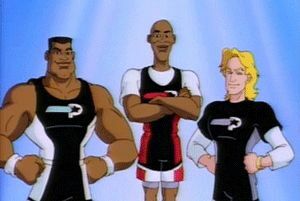 Gretzky was the biggest superstar in the sport at the time, and almost on a parallel with Michael Jordan and Bo Jackson as the top athletic stars of the time (Prostars confirms this). The move made the Kings an instant contender, and roused hockey fans from all over the state of California. Those Kings, however, never managed to lift the Stanley Cup trophy, despite an excellent collection of talent. From the mid 1990s to 2012, hockey in Los Angeles was essentially a non-factor. The rise of the Lakers at essentially the same time shifted the attention of most L.A. sports fans away from the Kings. They remained on the outskirts of the Southern California sports scene until the spring of 2012. At that time, Jonathan Quick became the newest Los Angeles Kings celebrity athlete, when he backstopped an eighth-seed team on an absolute tear through the NHL playoffs, culminating in a 6 game victory over the favoured New Jersey Devils. Fans were once again talking about the Kings, and celebrities who were normally seen courtside at the Staples Center, were now being seen rinkside at the Staples Center. While TV ratings were lower than the 2011 finals, that was a banner year for hockey ratings, as one team was from Canada, and the other was from a huge hockey market. Had the lockout not ruined the 2012-2013 season, I believe we would have seen a growth in hockey’s popularity in the southern states. My second greatest moment of 2012 was Andy Murray defeating Novak Djokovic at the U.S. Open to finally win a grand slam. Murray became the first British male since 1936 to win a grand slam singles title, and he had long struggled to break through and win one. This was a great moment on a personal level, and for the British people as a whole. Sports fans love to see a determined, hard-working player achieve their dream after years of disappointment. This is one of the classic athletic archetypes, and it’s why we continue to tune in, day after day, week after week, hoping to see something spectacular. In August, Murray gave us one of those spectacular, personal, emotional moments, and vindicated us for spending a few hours on a lovely summer day sitting on the couch watching tennis. Thank you for that, Andy. The Breakthrough by Andy Murray. From a national perspective, Murray had a huge weight on his shoulders this past summer. Great Britain is one of the founding nations of modern day, grand slam tennis. In the 1920s and 30s, Britain dominated the sport. Since then, however, the global spread of tennis pushed the Americans and certain Europeans (Swiss, Spanish) to the forefront of the sport. Murray’s victory could be more significant in the lasting effect of having more top British athletes, males and females, enter tennis as a serious endeavor rather than soccer. In Canada, we have our own Andy Murray, albeit a few years younger, in Milos Raonic, who can hopefully develop into a Murray type player, challenging the best in the world at tournament after tournament, until finally winning one and making Canadian youngsters realize the possibility of a sporting future away from hockey. Lastly, Lionel Messi is the best player in the biggest sport in the world. Do you know what he just accomplished this past year? If you answered no, you’re not alone. Messi has scored 90 goals from January 1st to December 20. This is a record for most goals in a calendar year, beating the previous record by 5 goals. Soccer is widely known (and sometimes mocked) as the sport with the least scoring, but Messi was still able to reach a number that seems ridiculous, even in comparison to other sports. 90 goals for a hockey player is an outrageous, almost impossible amount. 90 home runs in a season? Never. 90 touchdowns? Think again. The Smallest and the Best. This is a story that has garnered absolutely zero attention in North America, but why? Is it because few North Americans understand the significance of the total? Maybe Europe is too far removed from our sporting hemisphere for people to notice or care. Does it matter that Messi is about 5 and a half feet tall? Or that he comes from an impoverished area of Argentina? Or how about the fact that he suffered from a growth disorder as a child, thus resulting in his diminutive stature? Yes, it does. Messi provides hope to kids that are “too small”, “too weak” and so forth, that with determination and perseverance they too can achieve great things in sports. Even if you disregard all of that, and only look at the 90 goals in its own right, you still have to give Messi his props. In any case, I believe this will stand as the greatest athletic accomplishment of 2012. Dan: 2012 was a big year for sports and there were a ton of issues that merit being called the biggest sports story of the year. For my list, I’ve tried to stick to the fun stuff, the reasons we love sports. The Jerry Sandusky’s and Jovan Belchers of the world are tragedies and certainly newsworthy stories. But when I remember 2012, these are the things I’m going to think about first. For everything we’ve talked about so far, the only actual champions from 2012 we’ve mentioned are the NBA’s Miami Heat. But beyond LeBron finally breaking through, 2012 will be remembered as the year of the Giants. Both New York’s football Giants and MLB’s San Francisco Giants claimed their respective titles in 2012. Both teams claimed their second championship in a short period of time (San Fran with their second in three years, New York with their second in five) and did so against a favoured opponent. For New York, the ghost of their 2007 defeat of the mighty and nearly undefeated New England Patriots was the looming story throughout the Super Bowl. Could Eli and company do it again? Was the first time a fluke? The answers to those question aren’t mutually exclusive, as they did manage to do it again and I still think 2007 was somewhat of a fluke- if you play that game 100 times, I think the Patriots probably win it at least 90. But the rematch was different. While the Giants again came in as heavy underdogs and the Patriots had the best record in their conference, the Patriots were not nearly as formidable as the 2007 version. A shaky secondary and non-existent pass rush led to them being a team that could be scored on early and often. And with the Giants defeat of the defending champion Green Bay Packers, their confidence was at all time high. In a tightly contested battle, the Giants won 21-17, cementing Eli Manning as a big game quarterback and giving him one more Super Bowl than his more famous brother. Tom Brady and Bill Belichick, for all their accolades, are now without a ring since 2005. I’ll remember this game for a few reasons. It was the first Super Bowl since 1995 that I didn’t actual watch live; living in the UK does have drawbacks in terms of being able to watch live sporting events. However, I followed the hype leading up to the matchup and I have to say, I’ll always remember it for the arrogance of Patriot fans who assumed revenge for 2007 was in the offing. Obviously I can’t paint all Patriots fans with the same brush, but to see them get kicked in the teeth again, by the same team who ruined their undefeated season was pretty great, mainly because if they won, they’d be insufferable (Alright alright.. MORE insufferable). The San Francisco Giants second World Series win in three years was much more of a feel good story. In an era of big market, free spending teams such as the Yankees and Red Sox and Rangers, the Giants have taken the top prize in two of the last three Fall Classics with their own homegrown pitching staff featuring Matt Cain, Tim Lincecum and Madison Bumgarner. Led by 2012 NL MVP and all around swell guy Buster Posey, the Giants handed the Rangers their second straight World Series loss, a feat not accomplished since the 1991-92 Atlanta Braves. While the Giants are far from small market, they’re also far from the the Evil Empire and it was great to see a well run team of homegrown players actually play with guts and passion. The 24 year old Posey’s recovery from a gruesome knee injury and emergence as a star, as well as the emergence of Sergio Romo as the bearded maniac closer du jour provided lots of reasons to like the Giants, while the Rangers have lost Josh Hamilton this offseason and might be seeing their window of contention slipping shut. 2012 was certainly the year of the Giants. Being the official Same Page foreign correspondent, I’d be remiss if I didn’t mention the Olympics that happened on the same soggy islands as myself earlier this summer. The Olympics in the UK are far different than they are anywhere else in the world. Edinburgh, where I live, is a 5 or 6 hour drive north of London, yet on a main thoroughfare in the city, the Olympic rings were proudly displayed for the length of the games. While London hosted the games, events were held in Manchester, Liverpool, Newcastle and Glasgow. It was truly a national celebration, from Danny Boyle’s ‘inside’ opening ceremonies, to the national pride felt when Jess Ennis took gold. However, for me, the Olympics will be most memorable because they were when we anointed two of the greatest Olympians of all time. Usain Bolt dominated the 100 and 200 meters, becoming the first man to successfully defend both titles. To watch Bolt run is like watching a lightning bolt explode from the sky. He is truly a force of nature and has spoken about attempting a possible three-peat in Rio de Janeiro in 2016, something that would vault him to the front of the debate of the greatest all time Olympian. An indelible image of victory. To get there though, he’d have to pass the immortal Michael Phelps. Much maligned at the beginning of his London Games, Phelps took a silver and a bronze and whispers began that he had lost it. Then he reeled off four gold medal victories and another silver, becoming the most decorated Olympian of all time. Oh, OK. Not bad! Phelps at this point, is certainly near the top of any discussion of the greatest all-time Olympian. He certainly has a statistical advantage due to the multiple disciplines in his sport, but his sheer dominance over the course of three separate games are something the likes of which have rarely been seen. I’ll always remember sitting at work in the summer time and everyone crowding around to watch him break the medal record… and then our break ending and us totally missing it. But he still did it! So good for him. London will forever be remembered for Jess Ennis, inside the UK. Everywhere else, it will be remembered for Bolt and Phelps. I’m not going to whinge on too long about this but here’s what you need to know. Peyton Manning recently had 4 neck surgeries. That’s not a typo. 4. Peyton Manning is 36 years old. Peyton Manning, the greatest Indianapolis Colt of all time, was cut by the franchise as they didn’t think he was a safe bet to ever regain his past form. Peyton Manning is currently healthy, has played every game this season and is starting at the most difficult position in any sport for a team, the Denver Broncos, that’s poised to make a playoff run. The Denver Broncos made a polarizing move and traded a saint because they wanted Peyton so badly. So far this has not come back to haunt them. Peyton Manning is likely to win his record extending 5th NFL MVP at the end of this season. Regardless of what happens for the rest of the year in the NFL, even if my beloved Packers manage to win the Super Bowl, I’ll always remember 2012 as the year when Peyton Manning proved he still had it. And Chris… about yesterdays opening. I’m not sorry.